I want you to go back to New Year’s Day 2009 with me for a second. I’d recently left a job and was embarking upon a new career, one in which I was self-employed. I pulled out all the stops and created a vision board that contained all of the things: how much money I wanted to earn, how I wanted to dress, where I wanted to vacation, how I wanted to eat, and everything else I could think of. I thought if I created this vision board, if I planned out exactly how things would go, somehow I’d find satisfaction and peace. I remember later that same year visiting my then-boyfriend (now husband) when he was working out of state. The area where he was working was gorgeous, and I kept writing down the future I wanted, what it would be like to live in a place like this, how it would feel if only we could afford a place here, near the ocean. I also remember being obsessive and miserable. None of the stuff I was clinging to so tightly worked out. Life unfolded, all was well, but all that planning wasn’t making my life better; it was making it more stressful. Every year, I’d come up with new goals, new dreams. Almost always they’d have something to do with controlling the way I ate, or how much money I made, or how to figure out the “right” career for me. Even last year I bought a big old notebook, divided it into sections for each month, and wrote down goals. Big goals for the year, smaller goals for each month, all things designed to bring me the happiness I was seeking. But this past year has changed me. I no longer try to plan far into a future I can’t predict, and I no longer expect outside circumstances to bring me internal pleasure. I’m not exactly sure what happened, but I know pushing myself to visualize the life I wanted, over and over again, and obsessing about writing down my goals finally got to me. I finally got to a point where the last thing I wanted to do was think about those things. I wanted something new. I wanted to meet each moment where it was and ask myself: What’s next? What should I do now? Recently I was letting my mind spin into high anxiety mode. I was freaking out about money and career and every other thing you can think of. Instead of my usual planning and searching and trying to come up with something to work toward, I sat down. In fact, that’s often the answer I get when I stop and ask what to do in the moment. It may seem weird—I mean, shouldn’t we be planning for our retirement? Maybe sometimes, but more often than not I believe stopping and realizing this is it, this is the moment to stop and breathe, this is the moment to chill out, is a better way to live, at least for me. I feel happier and more settled this year, and I don’t have a resolution or goal in sight. Here’s how I’m approaching life nowadays: with the intention to stay in the moment and simply do the next right thing. I didn’t come up with any resolutions for this year. Okay, I guess I have one, but it’s an intention, not a resolution: to remind myself to check in with the present moment rather than letting my mind go in circles trying to figure out what the future holds. Because that makes me feel worse, not better. I committed to letting go of obsession. I’m still human—I still have things I hope to achieve, and I still have dreams for where my career might go, I still have lots of places in the world I want to visit. I’m not giving up; I’m just doing things differently. As soon as I feel my anxiety start to rise, as soon as I start to think the same thoughts (or worry the same worries) over and over again about what the future may bring, even if it’s something positive, I stop. I stop thinking, I stop planning, and I breathe into the moment. I remind myself every single day to ask myself what’s next right now. Not what I should do next year, not what my five year plan should be—what I should do in a minute or two from now. The way I do this is pretty simple: I either pause for a moment and see which thing seems like the most delightful thing to do next, or, if I’m in a stressed out place, I pause and write to myself. It’s journaling, really, but a type where I’m having an internal dialogue with what I think of as my heart. I’m looking inward, intending to hear what the deepest part of me would like to do next rather than letting my mind run away with the show and tell me all of the things I should be worried about. I sit still, breathe deeply, think about something that makes me feel calm and content (that usually involves imagining or petting one of my cats), and then write down a question. I ask what to do now. I ask what I can do to calm down. Then I just listen. Like I said, the answers I usually get have to do with lying down, or resting, or relaxing, or letting myself have fun. It’s all stuff that sounds really great, truly. It makes me feel better, not worse. I can hear the arguments now, though: You have to have a plan. You can’t always have fun! I’m not suggesting you empty your 401k or sleep all day, not at all. I’m suggesting that, at least for me, checking in with myself and listening for what to do next—not worrying and obsessing about how to achieve, achieve, achieve—is the key to a calmer, happier life. Yes, I have dreams and a vision for the trajectory of my career. Yes, I think about my health. Yes, I have plans to travel this summer. But I think about those things when it’s time to think about them, like in the exact moment I’m at my computer and can look at rentals on Airbnb. I don’t need to worry about it, stress about it, and think about it at other times when I can’t do anything to change it. The same goes for everything else in my life: I can’t become an overnight success; what I can do is find out, in each moment, what would serve me in moving toward the ideas I have for my career. Sometimes I truly think I’m being told to rest because that is what will serve me best—because I need a break. It’s simple though not always easy: Slow down and check in with yourself. See what the next right move is, the thing you should be doing in the next few minutes. I know it makes me feel calmer and more centered, and, so far, has never led me to feel anxious or worried. If you set a bunch of resolutions at the start of the year and are finding it hard to stick with them, maybe this is the perfect time to shift your focus from what you want in the future to what you need right now. Jen Picicci is an artist, writer, and teacher living in the mountains of Western North Carolina. She’s currently obsessed with creating whimsical watercolor landscapes and teaching women how to hear their own inner wisdom. To see her art, follow her on social media, or take her self-study Inner Guidance 101 class, visit www.JenPicicci.com. 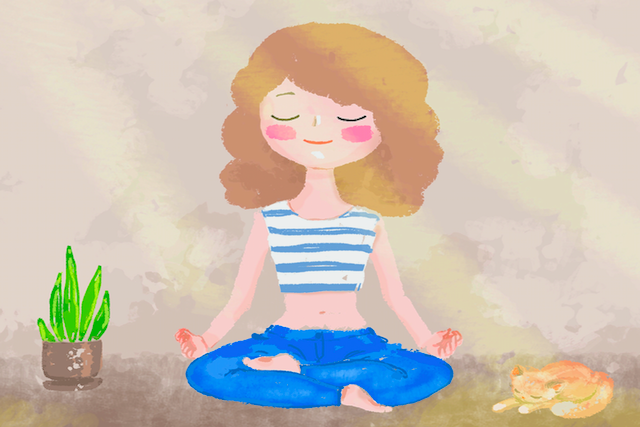 The post Why I Focus on What I Need Right Now Instead of Obsessing Over the Future appeared first on Tiny Buddha.